The Band Effect splits the audio signal in two or three frequency bands. Each band can have its own effects. After effects processing the three bands are mixed, where the Volume knobs control the band levels. The bands are split using first order filters. 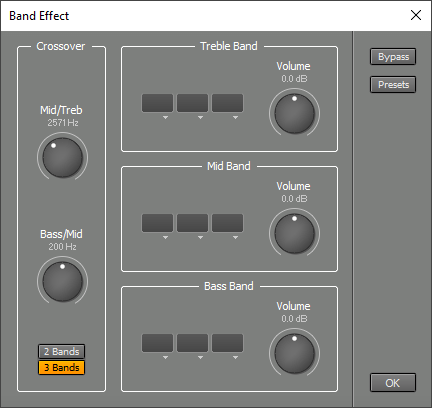 Using the Band Effect you can build a three band compressor for mastering purposes, for example. The Vocal Removal preset is a vocal remover built with a Band Effect. The Mid Band includes a Stereo Effect with a Phase Inverter effect in order to remove the sound at the center of the stereo image. As a result, the mid frequencies at the center of the stereo image are removed. The Bass/Mid and Mid/Treble knobs can be adjusted to keep as much bass and treble as possible while still attenuating the vocals sufficiently. Vocal Removal only works if the audio signal is stereo, the vocals are panned center, and there's not an excessive amount of stereo reverb on the vocals.